1. 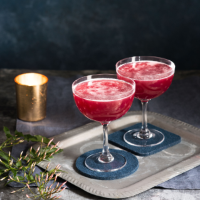 Mix together 1 slice fresh root ginger, 30ml sloe gin, 30ml cranberry juice, 40ml pomegranate juice, juice of ½ lime and 50ml rosé champagne. Strain and divide between 2 cocktail glasses to serve. This recipe was first published in Thu Feb 01 16:22:26 GMT 2018.